Long back as an upright teenager, I had made a decision to never change my name after I got married. I simply liked it too much. When A and I were getting married, we never discussed about it because we both knew how important my name was to me! I was known to the world by my name! It was my identity. It simply didn’t make sense to change my identity just because I was getting married. However the first of the numerous questions that came my way because of this, was from the marriage registrar who looked positively scandalous as I signed my name, the original first and last, instead of A’s, in neat letters. He thought I wrote it mistakenly out of habit, and when I asserted it certainly was not, tried to talk me out of it, offered a new form and when I still didn’t buzz, looked pissed. Since then, I have lost count of how many raised eyebrows and wounded egos my not changing my last name has caused. Even though actually it was just because I liked my name very much and being super lazy tried to avoid all the extra work of visiting the passport office, bank, post office, changing the official transcripts and emails and I don’t even know what else, time again it was imposed upon me that it was the deed of a terribly stupid and headstrong feminist who has no real notion of what feminism is and tries to defy every social norm. Each family is identified by a common name. It’s like you are deliberately trying to set yourself apart from the family! If we need a common name to identify our family why not combine both names? It’s my family too now, isn’t it? Why must I lose my identity and can’t unite everyone under a new family identity? A and I are starting a new family after all. Ah! You reek of feminism! I didn’t know feminism stank! But now that you bring it up, let’s face it. Men do not have these obligations! Why must a woman? You can use both names you know? Many do that! It’s still a change in my name! Maybe our children will use both names. Is your husband okay with it? Why wouldn’t he be? We are two individuals choosing to be married to each other because we love each other. What’s that got to do with what names we use? I really don’t find a good enough reason to buy into such a retrograde practice. With time, I have come to realize that it indeed was a defying thing to do. Defying male ego – the fragile inflated thing that breaks and bursts at the slightest nudge. And God save those men who don’t seem to have one. Letting one’s wife use their own name – it’s like a blow to their masculinity. The man in my home doesn’t care, and feels it is too trivial a thing to discuss but the men at my office (it is the place where I meet the majority of my male acquaintance) feel so differently that it was a shock. Some even felt that it was the greatest insult their wives could throw at them. Really? For a time I used to worry about – after making so much progress socially, economically and politically why must a woman still be subjected to such a sexist and outdated custom to make decisions when she gets married? But then, these days, I don’t care. It’s about our lives, as husband and wife together and everything should be about how we build it. Rest of the world will get over it sooner or later! good to read about your liking for your name! warm wishes! Yes! Truly! Why can't the couple have a new name to themselves as a "family name" rather than only the woman? Like your husband, I guess it's an trivial issue. Choice should be the key word. Glad you did what you thought was right. It's should be just about that really! choice! But it's shocking how people react to it. Such nonsense!! You should be entitled to decide whether you want to change it or not!! I look at this in a different way, along with the male ego it also adds pride to the male genders when his wife is identify with his name. But it should be the part of a woman, not the men, to decide whether to change or not as this will not cause any harm to anything or anybody. Hope no man look at this as female ego :). As rightly said this is a very trivial issue as there are lot more things in life to be addressed. Ps: I know, Its very late to comment but i think it is Okay to register my feedback here… I loved the characters of your book… so very lively… and i could see the change of phases of your life in your words that the book as undergone along with you. I am shocked at how the people at your office reacted ? I mean really ?? .. Such stupid thing this name changing is .. even I do not intend to change my name as I love it too much .. Thank you for visiting. Welcome to my blog. And yes, this is how many men feel, you know – hurt, if the woman does not take his name! But ask them to take their wives' names and you see their male ego emerging forth! I'm so glad that you decided not to give in to the pressure. I have not changed my name either after marriage. It is so difficult to accept to change that the name you have grown up with and came to love over time, a name that stands for who we are today. People will have an opinion no matter what. The best is simply to ignore. Thanks A. I am glad too that you decided to keep your name unchanged after marriage. 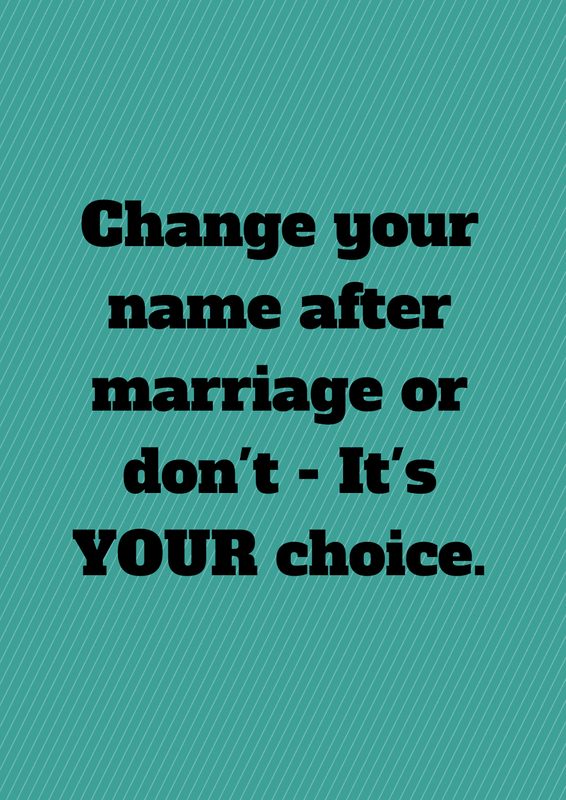 Its really difficult to respond to another name suddenly….just because you are married!